This is such an interesting question. It helps us understand and identify what makes us happy. What are you doing? Where are you? Who are you with? These additional questions help us hone in on the details of what makes us content. The more we understand what makes us happy, the more we can focus our energy and time on activities that gratify our soul and fill our hearts with joy. I feel most like myself when I am creating. I might be cooking, baking, painting, crafting, home decorating, writing, styling outfits, or any other activity that allows me to stretch my imagination and exercise my brain. Creativity is adult play. There are no wrong answers. Give yourself the freedom to explore. My husband and my pug. They both accept me, faults and all for who I am. Okay, Zoë will accept anyone with food but I like to believe she would still have my back. A close second would be my group of girlfriends. They inspire me, make me laugh till I cry and support me without judgement. If I had to choose a place where I feel most like myself it might be hiking in BC. I used to think of hikes as stress reduction, meditation walks. I’d visualize breathing in fresh green and blue air and exhale stressful red and yellow. Nature centers me physically, emotionally and mentally. What clothing makes you feel most like yourself? 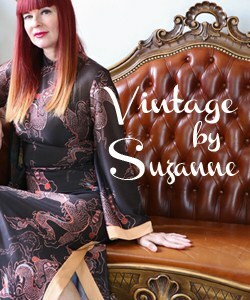 I feel most like myself when I am wearing bright and bold vintage or secondhand clothing. It communicates important messages about myself. Helping the environment and wearing something unique are two priorities for me. Of course wearing something that makes me feel beautiful and good about myself is also very important. 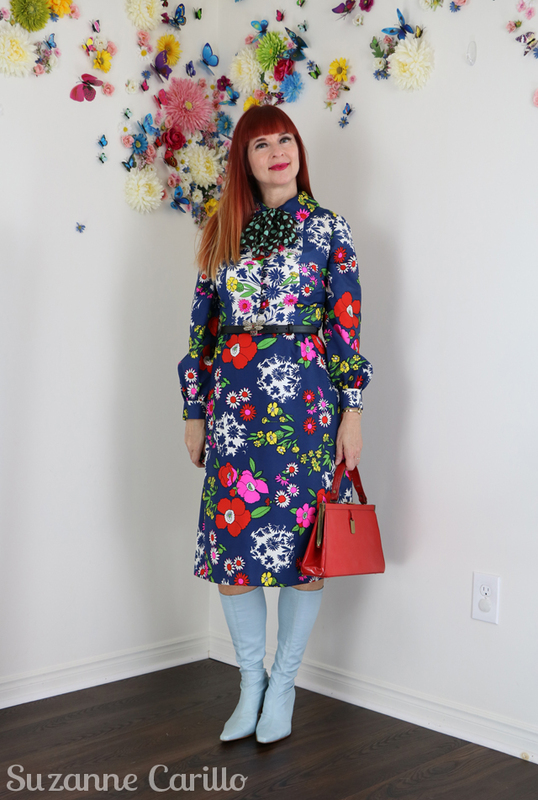 Vintage dress – Ian Drummond, Vintage handbag – Retrouvez Biz, Vintage boots – thrifted, Belt – Gucci – gift, scarf – Modcloth, old. As you can see I’m a maximalist when it comes to pattern and colour. Funny enough, although I own quite a bit of jewellery I rarely wear it. I let the clothes take centre stage. This is a face-off of two strong willed individuals. If you placed your bets on the furry stout one congratulations! Two pug hugs coming your way. What about you? When do you feel most like yourself? I’m probably most myself at the end of the day, chores and play are over, and a good book is on the nightstand. Or a gritty Netflix series. A cat or two on the bed, ahhhh. I *almost* didn’t fit into this dress. It’s so Gucci don’t you think? I’m surprised you didn’t mention NYC. Although cuddling up with some cats and Netflix sounds wonderfully inviting. I like you Suzanne am my happiest when I am doing ANYTHING creative. I hate being boxed in to a project, stuck in a room with snotty or uptight people, or uncomfortable uptight clothing for that matter. It’s a great question to REALLY think about, one I have been reflecting on quite a bit this past year. Like you, I believe what we wear is a reflection of who we are inside, but to be happy in what we wear, we need to reflect inward – before we can project outwards. I think it’s why so many women struggle to get dressed in the morning or say they hate everything in their closet – it doesn’t reflect who they are or want to be at that moment. So yes, I need to be creative in work and play. Next, I love being with my family. I have a big extended family, but when I am with my pod of 4; hubs and 2 teens, I am my happiest – we always have each others backs and have a great time together. As a necessity, I have to wear conservative clothing for work – ugh! I am most happy in a flowy bohemian dress, long sweater and some type of slip on shoe. I also love a pair of 70’s inspired jeans with a beautiful bell sleeve blouse and of course a long topper over it, a statement pendant in gold and a mix mash of gold bangles. I am a sucker for cashmere and anything animal print and love a big luxe handbag. Loved reading about your favorites – we all need out happy place and happy people to surround ourselves by! I do love your boho style. I agree, in today’s unstable world, surrounding ourselves with what makes up happy is the best coping mechanism we have. That’s such an interesting question, Suzanne!! I’m not even sure I can answer it in one sentence. 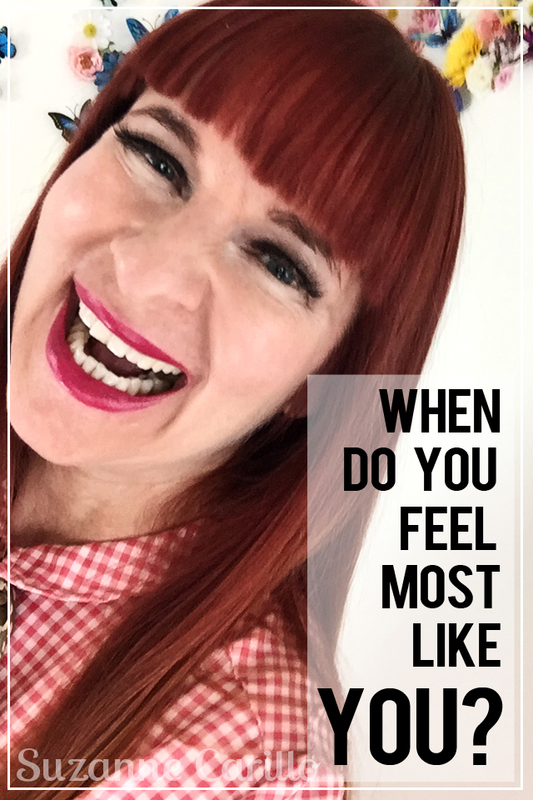 Because I feel like it changes depending….there are times I feel the best by myself (well, with my hubby) and times that I like it better with a bunch of friends (still with my hubby)—so I guess I’d definitely say with my hubby!! But I like home as much as I like to travel and explore. And eat….gotta feel myself when I’m trying new foods and dishes!! And shopping….See? so many things!! And so lovely to see how much you prize your husband and cute pug (she steals the show all the time!) and friends and fabulous clothes and hiking!. I love a walk through the city parks, under the trees, it makes me feel so much better! You look gorgeous in your beautiful dress, so colorful and cool!! Expressing ourselves through fashion is really fabulous! I’m not surprised at all that you also love being creative. You come across as a very creative soul. That’s a great set of questions! I love your radiant smile, that dress and your answers – it’s always good to see Zoe. I’m always me but happiest when I’m exploring far flung places or at a music festival with Jon although I love spending time with friends, drunken nights and days out and reading or watching quality TV with the cats and my crochet. 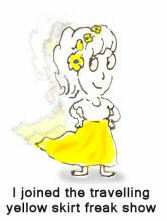 Yes, I can see that you adore travelling to off the beaten path spots. You are a much hardier traveller than I. Love how you refer to your love of jewellery as your armour. believe it or not – just swap the pug for the cat and BC for every woodsy, rocky land – then you will have exactly my post about it!!! really! This doesn’t surprise me. I see your love of nature every time I visit your blog. I enjoyed reading this as I think I feel most like myself when I am with my puppies, or petting puppies, or being around puppies. I love being in the woods, no makeup, hair up.. where we would go tent camping and just be in nature. I feel very free there and not encumbered by anything but enjoying my surroundings. When I went to a rock concert this summer, I felt very much like me- dancing and singing- just a free feeling that feels great. The abiiity to express myself is very much me- whether it is music, or nature. Dresses feel the most “like me” i love clothes that are not restrictive but still show the body.. Comfort. Gosh! I forgot all about the potency of puppies! I too wouldn’t mind being surrounded by puppies daily. I was surprised to see you enjoy camping. I would have thought you were strictly a city gal. I’m most me when I’m creating something – sketching, video-making, taking photos, painting, farking. And when I’m laughing, truly laughing. O, clothes, cats, they are all in there too. On the whole, solitary pursuits are my most me moments. Great question. Ah yes…I forgot laughing. One of my favourite things to do in life! It’s interesting that you recognize that you prefer solitary pursuits. Great post to get one thinking about what is important in one’s life. I would have to say I feel most like “me” when I am in New York, exploring neighbourhoods, visiting museums and spending time with my friends. I feel more inspired and energized there than I’ve ever felt in the city I live in. If only it weren’t so expensive to live there (and it wasn’t a part of the United States!) There is also a part of me that needs to spend time a lot of time alone at home in order to be able to travel and be social, and I realize that person who needs solitude in order to re-charge is also me. You and Patti are similar in that respect. She also love NYC. I think many of us find that socializing can be draining. Time alone to recharge is necessary for myself as well. Today I spent time nusting through the rocky soil in my Black Hills forest/yard and planted 3 deer resistant perennials. I was wearing overalls and gardening gloves. It was a couple of hours of hard work but I was joyfully me throughout. SOIL FARKING!!! Like you, I love to create. Sometimes “planning” and purchasing items needed for a creative pursuit is almost as much fun as the act of creating! Sounds like a wonderful day! I agree, the planning can be quite exciting. Lovely question and I could have guessed all your answers but one. I thought as the happiest place you would have chosen France or another place where the climate is more moderate and where the access to friends is easier. Canada knows such vast distances, it is not as easy for making and maintaining friendships like it is in my tiny country. And you hate the cold winters. For me, I am usually feeling like myself. But the happiest circumstances are exactly the same as yours, minus pug and plus cat Sophie and dog Charlie. That is interesting you would think I would choose France. Apart from husband being from France I have no other connections to that country and no friends there. I enjoyed living there when I did but the summers are far too hot for me, at least in the south where I lived and where my husband is from. I am interested to learn that you consider yourself creative and most like yourself when you are being creative. I know Ron is like that but I didn’t realize you were too. Ah… so Vancouver island and Victoria would be your favourite places. That I can understand. I thought of France because you speak the language so well and thought it might not be as hot or cold as where you live now. My mistake. Now.. you said something interesting: I consider myself creative?? I thought of the husband, the dog, the friends, the clothes, colour, jewellery. Creative? I am not. Not in the sense that I can create things like drawings, art, paintings, jewellery etc. The only “creative” thing I can do, is make a blog post. In a way it is creating as well. But not as in craft. Ha ha! Well, after being with a good-looking guy for some 28 years I’m kind of use to people telling him that or telling me that. Ha ha! Kooky clothes! 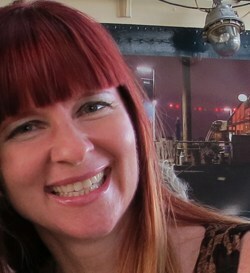 Hooray for kooky clothes is all I can say : ) I’m beyond delighted that my blog has helped you express yourself further. Like you, creating anything is a big one for me. That includes creating with good friends like we do in Vancouver. Walking around the city or in the woods provides another feeling of being me. 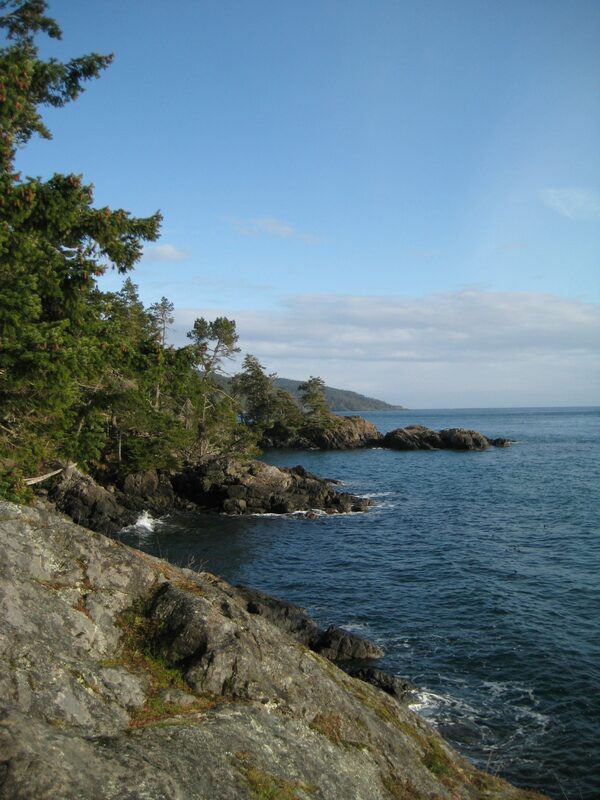 I loved that photo you shared from East Sooke Trail. It immediately made me relax a notch or two. And when I dress in clothing that makes me feel good from inside out, I feel totally myself no matter what it is I’m doing. See how similar we are? There are also the times when I feel rooted in myself but a part of something bigger than myself–like universally big. It’s been a while since I felt that, but I can access it through music sometimes or when I look at the stars in the sky and think about how far away they are. One thing I’m learning, which is so new to me, is how far “me” extends. I had in my head this box–this is where I am–but I’ve started wearing pieces around town that are bolder. They’re bold but still me. And there’s a certain freedom in that. It widens the box a little and makes me see myself more vividly. It’s really interesting! 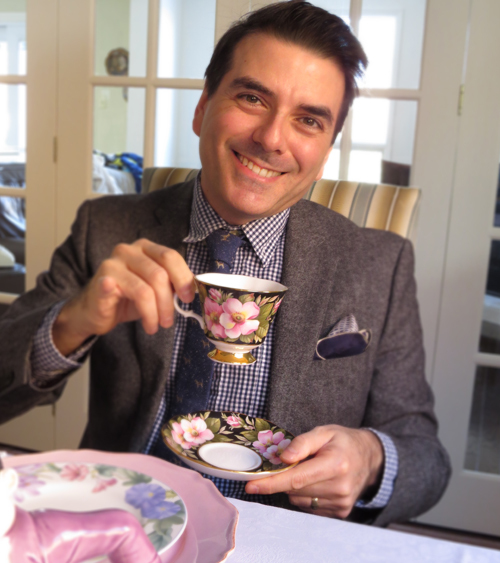 All that said–thanks for the question! You made me think. 🙂 Plus, as always, I LOVE your dress! There is much wisdom to be found in feeling small and feeling at one with the universe. It is humbling and liberating. The paradox of knowing we are so insignificant and yet still part of it all. I can see your style wings slowly unfolding and becoming larger, breaking free of your box. It is very exciting! Any project that allows me to be creative has me in my element, but first and foremost my swimming time is when I totally feel at one. I suppose that’s me, stripped bare of fancy clothes and embellishments, being the version that is a constant throughout my life. That restorative time fulfills me, which prepares me for being all the other me’s I have to be in a day – wife, mother, sister, aunt, gallery manager, blogger, friend, confidante. Thanks for another great post that wouldn’t look out of place in a magazine or even your book…. I can see where your swims are meditative for you and centre your mind and body for the day ahead. It is wonderful that you live in a place that enables you to enjoy outdoor sea swimming. When I first saw this post, I thought it is too important to comment upon hastily (and I was distracted by work-stress to address it properly). Now, re-reading it, I appreciate your questions and answers so much. I see clearly how your answers reflect you. And similarities in your and my answers explain why we’re good friends. Creativity is my passion and will be my future focus once I can afford to stop working at a joyless job. I’d like to answer these questions but don’t want to clog up your blog. So, if it’s okay with you, maybe I’ll give my answers in a post on my blog (with a link here, of course) so I can go into length. Again, excellent, probing questions. The kind of inquiry serious minds pose when wrestling with big life issues. Yes you certainly dress like a creative maximalist, and I can relate! I adore your vintage dress and those baby blue boots are divine. I feel most like myself when I’m relaxed with friends or my husband. Since I am a pretty social person, I think that is when my best self is happiest. But, like you, I also love to be at home doing anything that is creative . It’s a close call. 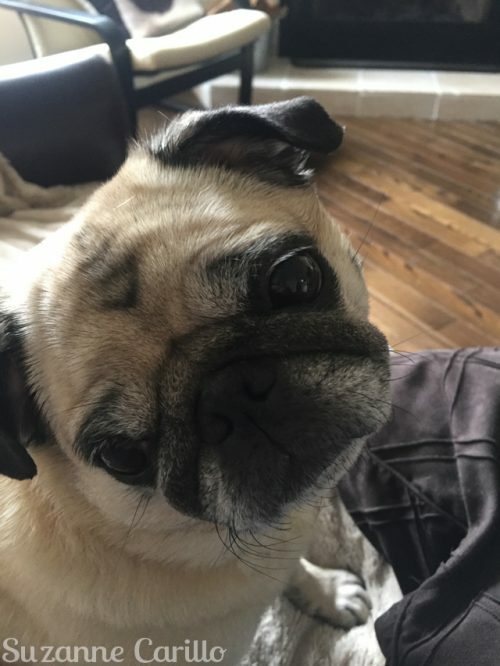 I adore your pug but I do believe you won this round ! Very inspiring post, it made me pondering myself, when exactly do I feel most like myself. I enjoyed reading your post. Love your photos, they are suggesting that life is great, life is beautiful! Wow. This post made me really think about stuff I’m not usually consciously aware of. But I now realize, like you, I feel most like myself when I’m being creative. I also have to be near the ocean. I love mountains, lakes, rivers for visits. But I feel most at ease near or on the sea. Driving alone on road trips, stopping in out of the way places, searching for vintage stuff. Being alone when doing this I can take my time exploring and poking around in shops and flea markets for as long as I like. It’s a form of meditation for me, where I really feel like my true self. No distractions at all! Thanks for your post. Sometimes you get so used to your routines and surroundings, that you take them for granted, not realizing how much they actually contribute to your overall sense of well being. Nice post, Suz, and great look! I feel most myself, like you, when being creative. Further: while tango-dancing. And third: with friends, preferably one on one. When I can give the other person my full attention, my heart, my love and my wisdom. And last but not least: with cats and dogs. They make me laugh and they fill my heart with joy.